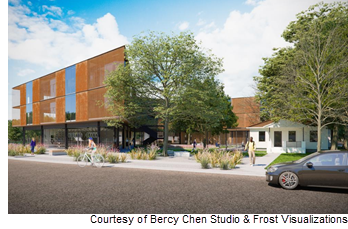 ​​​ AUSTIN – Shady Lane Creative Studios will be a 64,674-sf creative studio, retail and a potential art gallery space, planned by architecture firm Bercy Chen Studio LP. Located at 1141 Shady Lane, the $13.5 million project was designed entirely around a 1920s-era house already sitting on the property. The mixed-use site plans include three live/work studios, a three-story structure to house the design firm’s new office, and transforming the house into a restaurant. The project is expected to break ground in late spring 2018. The project is one of several creative office spaces to crop up on the east side in recent years as businesses tap into lower rents and an edgier vibe missing from the Central Business District. The Shady Lane property is part of a 24-acre master-planned development known as “thinkEast.​"